MINNIE: Oh, my. It looks like Power Pants Pete is shrinking things again! when your powers are going kaput. Right now, all three parts are green. But once they all turn to red... Then poofsy! You'll no longer be super duper, you'll be back to just being normal duper. 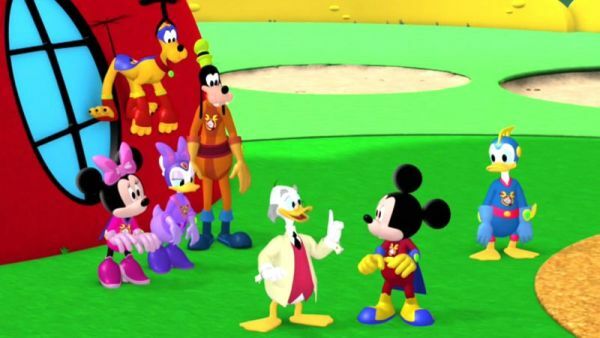 MICKEY MOUSE: Thanks, professor. OK, gang, I've got a plan to stop Power Pants Pete, And we've gotta work together. Here's what we should do. DAISY: I know, I'll stop the zeppelin with my mind. MINNIE: Wait, I can use my super wonder bows. DONALD DUCK: I'll stop it fast! GOOFY: I can stretch around it. 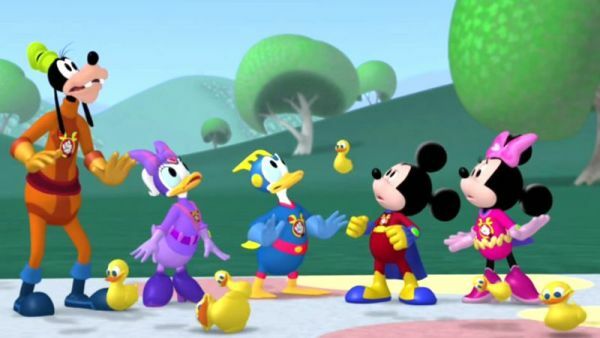 MICKEY MOUSE: Hey, listen everyone, we need to work together. PETE: Hey, Clarabelle! Make like a cow and moove! CLARABELLE: My moo mart! It's been moo-niturized. PETE: Sorry, Clarabelle, don't mind me. Just here to collect the moo mart. CLARABELLE: This is an utter cow-tastrophe. 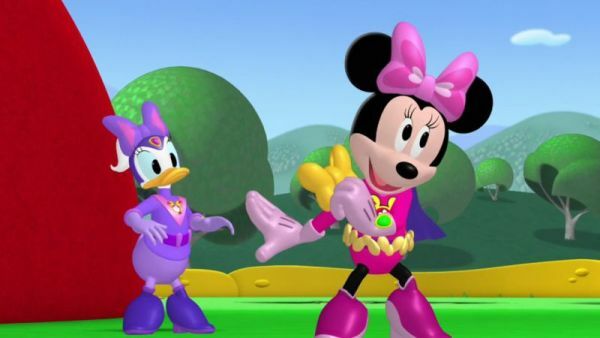 MINNIE: Oh, no, now Power Pants Pete is after my bow-tique. 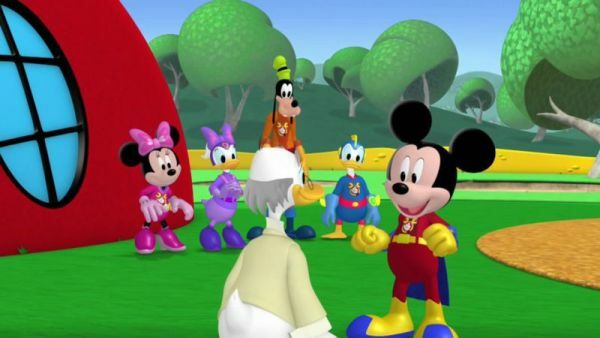 MICKEY MOUSE: OK, guys. What we need to do is... MINNIE: This calls for my wonderful super wonder bows. DAISY: No, Minnie, leave this to me. MINNIE: Uh-uh, wonder bows away! Oh, dear. DAISY: What happened? 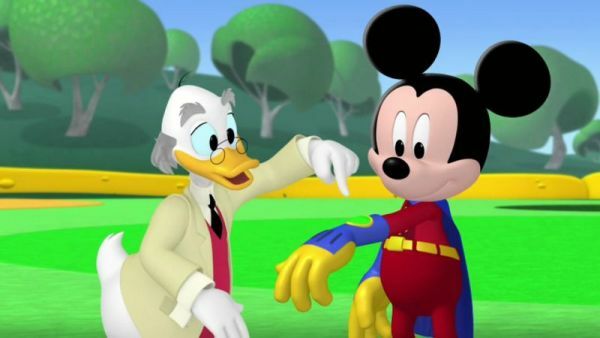 MICKEY MOUSE: Why, your super powers worked against each other. PETE: Well, what do you know, they all got super powers. Not gonna stop me though. Here's something that will really quack you up. GOOFY: Oh, no! 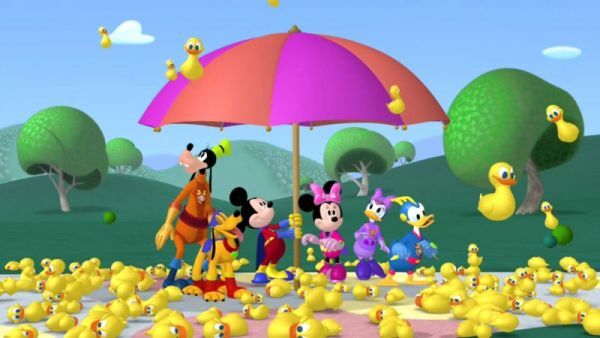 It's raining rubber duckies. Everybody duck! MICKEY MOUSE: Whoa! We need a super mouseketool. Everybody say, oh, super toodles! ALL: Oh, super toodles! 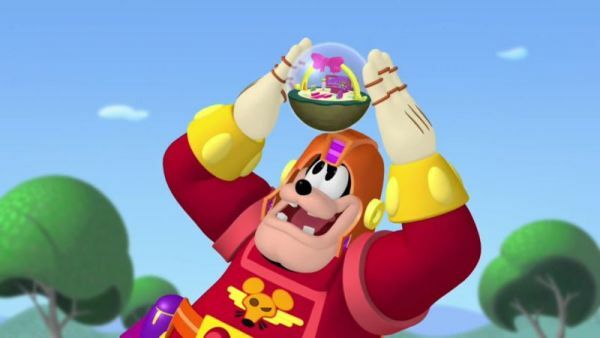 TOODLES: Su-su-super toodles to the rescue! MICKEY MOUSE: We've got a blow dryer. A catcher's mitt. A big umbrella. And the mystery mouseketool. What could protect us from all the falling duckies? Let's try the big beach umbrella. The duckies might bounce off it. We've got super ears. Say "cheers!" DONALD DUCK: It's working! Hooray! MINNIE: Oh, no, my bow-tique! PETE: Ooh! This is a pretty one, look at me. Power Pants Pete, promptly propel! DAISY: This isn't super goody-good. DONALD DUCK: Oh, gosh! MICKEY MOUSE: Oh! One part of our super power bands has turned red.